Gabby's recent article, Buyer's Remorse, made me realize my biggest problem with gun collecting; Seller's Remorse. 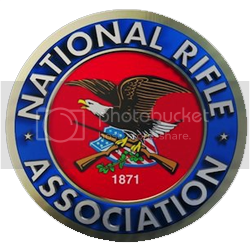 Over the past few years I have purchased and then sold a number of guns, pistols and rifles. Rarely do I regret buying a gun, but I always seem to regret selling one. In fact, I regretted selling one gun so much that more than a year after I said farewell, I went and purchased another one. The second gun that I ever bought was a Smith and Wesson M&P 15-22. It is a super scary, ultra-tactical, assault rifle-like, semi-automatic black gun (please note the sarcasm) that shoots .22 lr rounds and only .22 lr. It is an amazing rifle which can be used to hunt small varmint, teach new shooters and simulate AR-15 training with rounds that cost 1/10th of what .223 rounds currently sell. 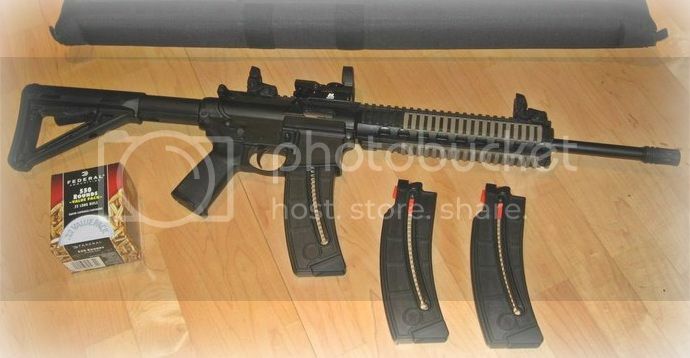 It matches a standard AR-15 in looks, size and operation (including a fully functional bolt-release). In Georgia, they come with collapsible stocks and a 25 round magazine. If you spend a little extra money, you can get one that comes equipped with a bunch of Magpul accessories. The 15-22 comes with a standard picatinny top-rail and fore-end on which you can install any scope or red-dot sight, forward grip, lights, lasers, etc. I can't say enough good things about this gun. Yet for some reason, a reason I can no longer remember, I sold mine. So, when I walked into the range yesterday and saw my gun sitting on the shelf; all shiny and new, I bought it without hesitation. I had been wanting another .22 rifle for a while and there will be no regrets this time. I'll probably keep this one until it falls apart. The moral of the story; Think before you buy, BUT ALSO, before you sell! Good advice! I bought a Colt M4 Ops 22 a few weeks ago and got my nikon optics on and sighted it in today..had a blast! Still waiting for mags to come in along with my vertical grip. Now, I'm trying to figure out what to put on the other rails. Lasers, lights, bipod ?? ... So many decisions. Great advice. I've thought about selling some of my guns before but thats as far as I get. I can't even imagine doing it at this point. I have an AR15 with a cmmg 22lr conversion kit. I find myself shooting the 22's way more often than the .223. Its a whole lot of fun. I wish I could put a 15-22 into the hands of every new shooter. Armed Candy was founded by Gabby to make shooting more accessible to women and newbies and this rifle seems to be made for exactly that (plus a whole lot more). I'll be putting a Lucid HD7 red-dot sight (plus magnifier) on mine shortly. Along with a sling and the five 32 round mags i just bought, this gun should be a perfect training weapon for a long time to come.